The new Elite CHIRP series shares its chassis with the popular Elite HDI units. Lowrance Skimmer transducers are bundled with the new Elite CHIRP series. Once the domain of deep sea oceanographers, Lowrance CHIRP technology is now something to really tweet about. Lowrance Elite-7 CHIRP was launched in April 2014. The Elite-5 CHIRP is launching in June. Lately it seems that with every new high-tech gadget released, manufacturers of marine electronics are engaging in a never ending battle of one-upmanship. They do this by cramming more and more features into the fishfinders, GPS and sonar we rely on to find our quarry. As commercial-grade marine electronics technology pervades the recreational fishing market, finding and identifying fish and bait has never been easier for recreational fishos... or has it? The problem with new technology is that it often requires new skills to operate and interpret. I mean what good is it if your new sounder can detect a pilchard passing gas in 50 fathoms if it takes you two days to locate the "ON" button? Lowrance intends to change all that with the release of its widescreen Elite-7 CHIRP in April 2014 (the compact Elite-5 CHIRP series release is in June 2014). The new variants build on the reputation established by the popular Elite-7 HDI and Elite-5 HDI units and are now capable of producing not only traditional sonar view, but 3D-like images courtesy of DownScan, and now CHIRP – without resorting to fitting dedicated and expensive new transducers. I’m a fan of the Elite 7 HDI – which remains in the lineup at this stage – and find its simple interface and crisp DownScan images ideally suited to those who don’t require the additional performance of a HDS unit with StructureScan. The compact landscape architecture also enhances mounting opportunities in smaller boats. So how would CHIRP make it better? For the uninitiated CHIRP, an acronym for Compressed High Intensity Pulse, promises much cleaner (less noise) images and better definition of individual returns. Unlike a single or dual frequency transducer that pings at typically 200 or 50khz, a CHIRP transducer transmits a sweep or range of frequencies – in this instance between 160khz and 240khz – allowing improved definition and a better breakup of arches that are close to each other. Looking at echo returns of sparsely distributed fish or bait sitting high in the water column, it’s relatively straightforward to discern one signal from another. However, when the fish are sitting tight to a rough or weedy bottom or very close together, things aren’t quite so clear – forgive the pun. The easiest way to experience the difference is to run either unit in split screen mode displaying both a standard image and the CHIRP enhanced version. The difference will be obvious as blobs of colour are revealed as multiple clearly defined targets. I’ve reliably used CHIRP to locate flathead and whiting sitting little more than an inch off the bottom, a feat that’s hard to achieve with any other system, other than perhaps SideScan. By displaying more clearly the presence, quantity and relative size of individual marks, the angler can make an informed decision as to where and how to best concentrate his or her efforts. The new 7in and 5in Elite CHIRP series will be available as either standalone fishfinders (designated "X") or combo GPS models. Priced from $599 to $999 for the Elite-5X and Elite-7X CHIRP sounders respectively and $1099 to $1329 for the Elite 5 and Elite 7 CHIRP combo models, the latter include a Navionics Gold chart as part of the deal. All Elite CHIRP head units are bundled with an 83/200/455/800 HDI transducer as standard. Elite-7 CHIRP models are also NMEA 2000 capable opening up a host of integration options. 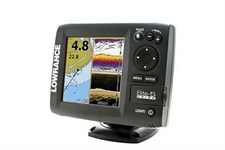 For further information, visit lowrance.com for more information.